This afternoon I was eating a sub in the Plymouth harbor, finally enjoying a bit of sun, which we haven't seen much of this summer. I was joined by a seagull chick. It was presumably hoping to score a piece of my sub. So why share this wholly unremarkable footage with you? The bird sat there for something like 10 minutes (gulls are nothing if not patient and persistent) and after a while it struck me that it didn't appear to look at me (or my sub) much at all. It seemed to be continuously distracted by something to its right or left, even though there was nothing there, at least nothing as interesting as my sub (I imagine). Then it dawned on me that, in contrast to appearance, the gull must have been looking at me all the time, but with different parts of its eye! As you probably know, we see only a small part of our surroundings with high resolution and in color. This is the part that falls onto our fovea, a small, extra dense part of the retina. 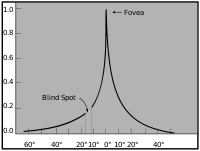 Foveal vision corresponds to about the size of a thumb at arm's length. Yet we feel as though we have a complete and full-color perception of our entire visual field. In large part, this is because our eyes are mobile: If we think about something, we immediately look at it (bring it into foveal vision) to get a crisp view of the object in question. So what does this have to do with the gull chick? Well, for birds it's much the same, but with a twist. Many birds don't have a single fovea (per eye), like we do, but two. (The details differ between species, but I believe the following applies to many species except birds of prey.) They have a temporal fovea, which is like ours in the sense that it looks straight ahead and offers binocular vision (i.e. the temporal foveas of both eyes point in the same direction). But birds also have a central fovea, which points sideways and is, obviously, monocular (i.e., the central foveas of both eyes look in opposite directions). As a vision scientist, I find this intriguing, because it completely goes against our (totally anthropocentric) ideas about vision. Basically all theories about vision assume that there is a single fovea, used to look at one object at a time, and that consequently we attend to only a single object (more or less) at a time. But how well does this translate to birds? Do birds have a more distributed awareness of their environment, as a consequence of their having multiple foveas? There is some research, notably by Robert Cook, that suggests that perception and attention in birds is actually similar to that in humans, but, in general, I believe that this is an open (and interesting!) question. Cook, R. G. (2000). The comparative psychology of avian visual cognition. Current Directions in Psychological Science, 9(3), 83-87. Dawkins, M. S. (2002). What are birds looking at? Head movements and eye use in chickens. Animal Behaviour, 63(5), 991-998. Land, M. F. (1999). The roles of head movements in the search and capture strategy of a tern (Aves, Laridae). Journal of Comparative Physiology A: Neuroethology, Sensory, Neural, and Behavioral Physiology, 184(3), 265–272.